Don’t adjust your picture and try to look for the planet “Tatooine” (Kepler 16-B), because you will not find it. Lieutenant Commander Data the android character on Star Trek “The Next Generation”, couldn’t imagine that one day, he would have a cell phone named after his kind. But my “android” cell phone took this image though our Kessler Telescope on Thursday evening (09.21.2011) at Farpoint Observatory. 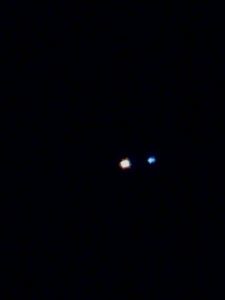 Drum roll please…….. Meet Albireo A & B, it is a double star or binary star system that orbits each other, like the planet or dwarf planet Pluto and its large moon Charon, in our own solar system. The binary star system is 380 light years away from planet Earth. Albireo A is the yellow star and Albireo B is the blue star. When star gazing the night sky and with a good telescope by your side, you can find Albireo A & B in the constellation “Cygnus” the swan, which often resemble cross-like appearance, otherwise known as the Northern Cross. Albireo A & B is often dubbed the nickname “the beak star” because of the binary stars location in the swan looking constellation. May The Stars and the Globular Star Clusters be with you!!! !